The 2nd Session of the 5th Member Representative Assembly of CCMA and the 15th China Construction Machinery Development Senior Forum was held in Jining, Shandong Province from April 12-14, 2017. 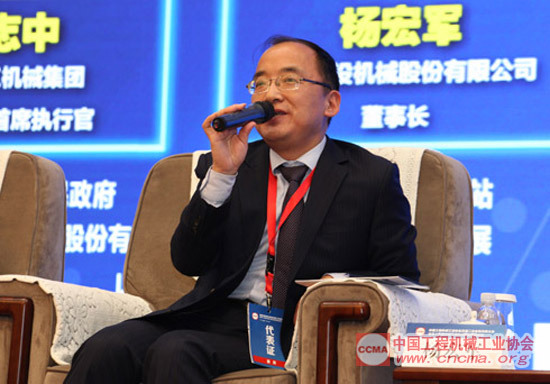 This Forum is organized by China Construction Machinery Association (CCMA), undertaken by Jining Municipal People’s Government and official website of CCMA, and supported by the National Hi-tech Industrial Development Zone of Jining, Shantui Construction Machinery Co., Ltd. and BICES. Among them are over 300 representatives like Deputy Chairman, executive directors and directors, member organizations and branches of CCMA, as well as representatives of the relevant media. This Assembly is organized by China Construction Machinery Association (CCMA), undertaken by Jining Municipal People’s Government and official website of CCMA, and supported by the National Hi-tech Industrial Development Zone of Jining, Shantui Construction Machinery Co., Ltd. and BICES. Among them are over 300 representatives like Deputy Chairman, executive directors and directors, member organizations and branches of CCMA, as well as representatives of the relevant media. 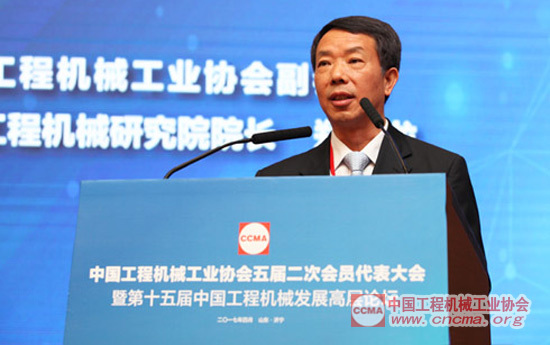 Bai Feiping, Deputy Chairman of CCMA and President of Xiamen XGMA Machinery Co., Ltd., presides over the Formu. Bai Shan, member of Jining Municipal Standing Committee, Director of the United Front Work Department and Secretary of Party Working Committee of High-tech Zone, speaks on the Assembly. Jiang Kui, General Manager of Shandong Heavy Industry Group, speaks on the Assembly. Jing Xiaobo, Inspector of the Operation Monitoring and Coordination Bureau of MIIT, speak on the Assembly. 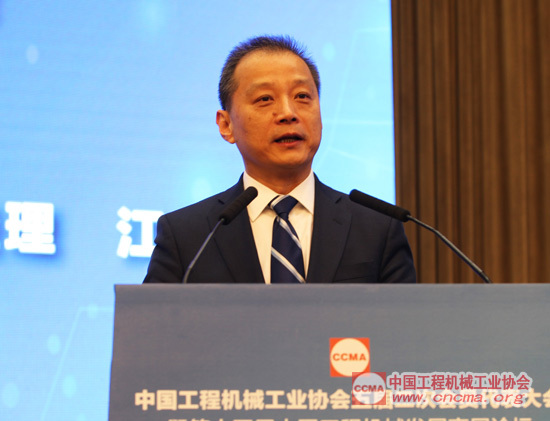 Qi Jun, Chairman of CCMA, delivers the keynote speech titled Vigorously Promote the Supply Side Reform and Improve the Quality Benefit of Industrial Development to Build An Engineering Construction Power. 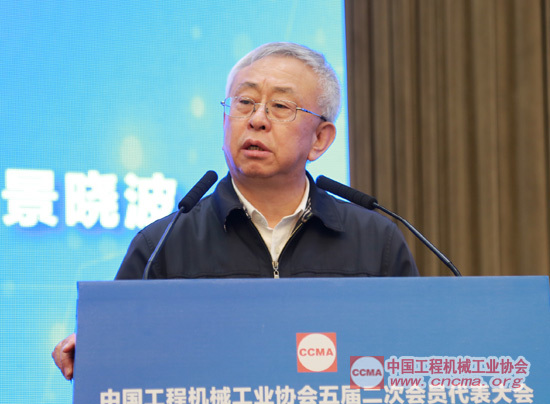 Qi Jun, Chairman of CCMA, delivers a keynote speech titled Vigorously Promote the Supply Side Reform and Improve the Quality Benefit of Industrial Development to Build An Engineering Construction Power. “The development of construction machinery industry witnessed some positive changes influenced by a series of policies and measures proposed by China to adjust the structure, promote the transformation and improve benefits. In the second half of 2016, the production and sales of main construction machinery products have been significantly improved, and the construction machinery industry witnessed spiral escalation. Thus, we must continue to firm our confidence, tackle the difficulties, strictly perform transformation and upgrade, forge ahead, fully utilize the favorable opportunities, thoroughly implement the Made in China 2025 Strategy, further promote the structural supply-side reform of construction machinery industry, and consolidate the foundation for healthy, continuous and stable development of construction machinery industry”, noted Qi Jun. Since the second half of 2016 till now, the marketing sales of construction machinery industry grow rapidly. On one hand, the under-construction, newly started and newly approved infrastructure projects are accelerated smoothly, the placement of project funds turns better, and measures are taken for encouraging and supporting the implementation of PPP projects. On the other, considering the service cycles of equipment and the measures for enhancing environmental protection management proposed in various regions, a substantial number of construction machinery enter the replacement cycle, and it is expected that the demands for such construction machinery will further increase in 2017, and even the next two years. The demand in construction machinery market gradually turns to upgrade of inventory equipment from increment demand. Goals in 2017: the operating revenue increases by over 10% compared to that in 2016, with obvious profit increase and stable increase of foreign trade import and export amount. It is expected that the development mode of the industry will be changed in 2017, and the quality and benefit of economic operation will be significantly improved. 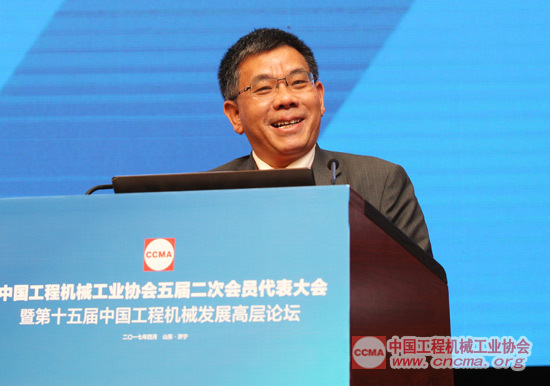 Su Zimeng, Executive Vice Chairman of CCMA, noted in his keynote report 2016 Work Summary and 2017 Work Plan of CCMA that, in 2016, CCMA made the following achievements by giving full play to its role in offering services, reflecting the appeals, standardizing the behaviors and leading the sustainable and healthy development of the industry: organized the 1st Session of the 5th Member Representative Assembly of CCMA and the 14th China Construction Machinery Development Senior Forum; organized to prepare and issue the Thirteenth Five-Year Development Plan for Construction Machinery Industry; held the Working Conference for International Capacity Cooperation of the Construction Machinery Industry, and set up the International Capacity Cooperation Enterprise Alliance of Construction Machinery Industry in China; sponsored and organized domestic and international exhibitions to serve the enterprises in expanding markets and enlarging the effect, especially BICES 2017; planned and established the in-service construction machinery supervision and old equipment elimination mechanism; completed the construction machinery identification application and registration with the help of enterprises, and edited the Manual for Identification Code of Construction Machinery (2013); strengthened the information statistics of CCMA and did well the monitoring and analysis to provide basis for the industrial development, as well as decisions of the government and enterprises; natured self-discipline environment, enhanced the evaluation of credit rating, and laid foundation for the construction of credit system for the industry. In 2017, all tasks will be smoothly advanced, and the Secretariat of CCMA will earnestly perform our responsibilities to continuously improve the cohesion and influence of CCMA, build CCMA an “international-leading and industrial authoritative” social organization and a honest, efficient, united and warm home for members, and make contribution to the sustainable development of the Construction Machinery Industry in China. Lu Mingde, Vice General Manager of Hitachi Construction Machinery (China) Co., Ltd., reports and submits the proposal for the Assembly for approval. 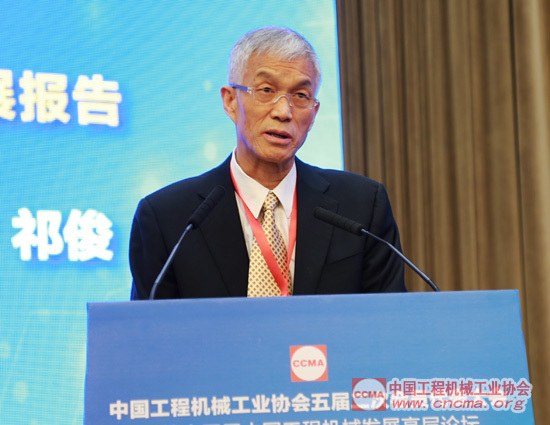 All participants carefully listened to, researched and reviewed the keynote report Vigorously Promote the Supply Side Reform and Improve the Quality Benefit of Industrial Development to Build An Engineering Construction Power by Qi Jun, four tenures of council chairman, keynote report titled 2016 Work Summary and 2017 Work Plan of CCMA on the Assembly by Su Zimeng, Executive Vice Chairman and Secretary-General of CCMA, and such proposals submitted by Lu Deming on behalf of the council as Report on Revenue and Expenditure of Membership Fees of CCMA in 2016, Proposal on Modification of the Articles of Association of CCMA, Proposal on Reviewing the Rules of Board of Supervisors of CCMA, Proposal on Composition of Board of Supervisors of CCMA, Proposal on Holding Election and Recognition Activity of CCMA, and List of New Members. On the Assembly, the establishment of Board of Directors comprised by Lv Ying, Deputy Secretary-General of CCMA, Li Yin, President of Beijing Eastern Green Cultural and Media Co., Ltd. and Zhai Huikun, President of Construction Machinery was approved through secret ballot. In order to further standardize the selection and recognition work of the Construction Machinery Industry, set an example for the industry and promote the healthy trends, it is proposed to select and recognize those organizations with remarkable achievements in the Construction Machinery Industry in China since 2018, and set such rewards as “Construction Machinery Industry Lifetime Achievement Award”, “Construction Machinery Industry Outstanding Achievement Award”, “Construction Machinery Industry Outstanding Entrepreneur Achievement Award”, “Construction Machinery Industry S&T Innovation Achievement Award”, “Construction Machinery Industry Outstanding Female Achievement Award” and “Construction Machinery Industry Outstanding Craftsman Achievement Award”. “BICES Construction Machinery Appearance and Quality Award” has been adjusted as “BICES (China) International Construction Machinery Innovative Product Award (Gold, Silver and other awards)” and “BICES (China) International Construction Machinery Recommended Product Award (Gold, Silver and other awards)” in accordance with the guidance of CCMA. To rectify and standardize the credit order and competition environment of the Construction Machinery Industry in China, establish a good image and strengthen the competitiveness of enterprises in and out of China, CCMA has begun to perform “enterprise credit rating evaluation” since 2013 authorized by the relevant national authorities, and has granted 2016 Construction Machinery Credit Rating Evaluation Certificate and Plaque to SDLG, SINOMACH and other enterprises. Li Jianyou, Director of China National Construction Machinery Quality Supervision Testing Center, presides over the meeting granting the 2016 Construction Machinery Credit Rating Evaluation Certificate and Plaque. Qi Jun, Chairman of CCMA and Su Zimeng, Executive Vice Chairman and Secretary-General of CCMA, grant the 2016 Construction Machinery Credit Rating Evaluation Certificate and Plaque. 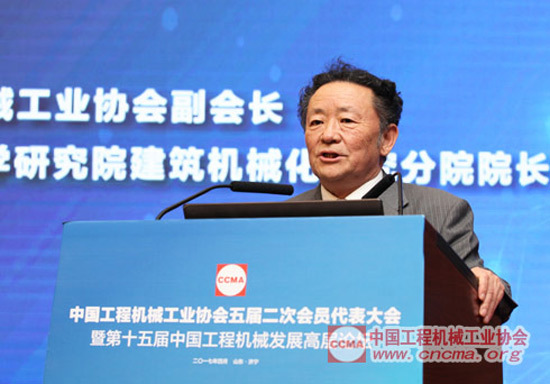 Qi Jun, Chairman of CCMA issue certificates for new members. Zheng Shanglong, President of Tianjin Research Institute of Construction Machinery, announces the minutes of meeting. On the afternoon of April 13, 2017 , the 15th China Engineering Machinery Development Senior Forum was inaugurated. 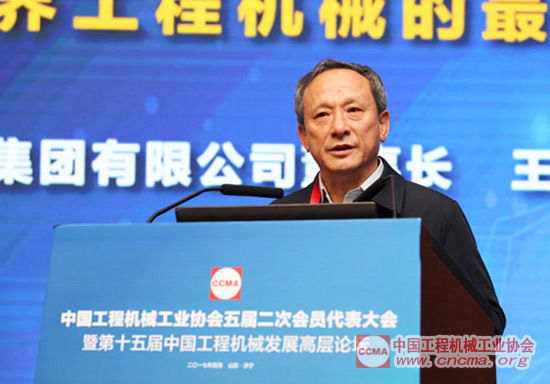 The Forum is presided over by Li Shoulin, Vice Chairman of CCMA and President of Institute of Building Mechanization, China Academy of Building Research. In the “keynote speech” section, senior managers of some famous enterprises delivered wonderful keynote speeches in combination with their respective conditions centering on the theme of “opportunity, rationality, value and development”. Among them are Wang Min, President of XCMG, Zeng Guang’an, President of LiuGong, Zhang Dejin, President of HELI, Chen Qihua, President of Caterpillar China, Yin Zhengfu, Senior President of ZOOMLION, Zhang Xiuwen, President of Shantui, etc. 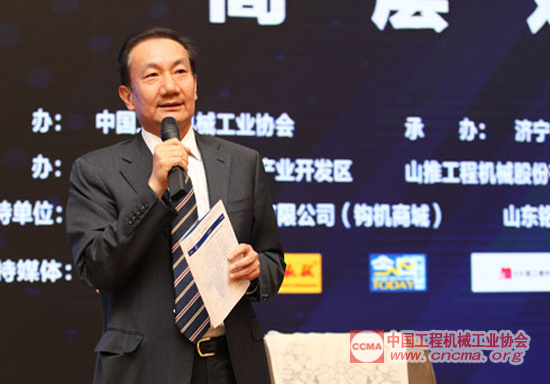 Wang Min, President of XCMG, delivers the keynote speech titled Stay True to the Mission and Forge Ahead Firmly to the Summit of Global Construction Machinery. 1. Adheres to make its main business construction machinery + auxiliary parts bigger and stronger, and insist on developing the featured industrial cultures of XCMG; 2. the main gap between China Construction Machinery Industry and foreign countries is technology, but we must keep improving and enhance our R&D and innovation capabilities; thus, XCMG proposed the idea of “leading technologies and durable products, and will comprehensively develop its main machine and auxiliary parts; in addition, XCMG established its R&D center in Europe to ensure the continuous product innovation; 3. create perfect supply chain and value chain; 4. Intelligent manufacturing is the priority among priorities of XCMG in the future, and XCMG may only satisfy the demands of customers with technologies and products in a rapid and comprehensive manner by improving its intelligent manufacturing. XCMG is confident and able to achieve these goals, and is willing to cooperate with all counterparts presenting the Forum for the development of Construction Machinery Industry in China. Views on Chinese market, international market and the industry and analysis on Chinese market in President Zeng Guang’an’s speech are shown through several sets of data: Change of Excavator Market Sales in China from 1990-2016; Market Holdings of Excavator in China from 2002-2016; Change of Loader Market Sales in China from 1990-2016; Analysis on Sales Data of Construction Machinery Market Worldwide. In the next years, China will sell 80,000 to 120,000 sets of excavators, and 40,000 to 60,000 sets of loaders; the total demand of construction machinery products in China is about 150,000 to 220,000 sets, while that of the world is about 800,000 to 1 million sets (including earth mover, crane, skip steer loader, backhoe loader, etc., but excluding concrete machinery) predicated by President Zeng. View on existing construction machinery market: balance under the new normal of China’s economy; heavy investment of governments at all levels; gradual recovery of excavating industry; supply-side reform of agriculture and forestry; decrease of market holdings and reduction of used machine inventory; irrational purchase of customers; accumulation of market risks; non-rationality out of rationality. In 2017, the sales may not increase, and even declines, at least this is the case for excavators. In 2018, the sales increase as a whole, but may not exceed the rate in Q1 this year. Zhang Dejin, President of HELI, delivers the keynote speech titled Grasp the Opportunities for Value Sharing and Insist on the Development Strategy for A Beautiful HELI. Zhang Dejin, President of HELI, delivered a keynote speech titled Grasp the Opportunities for Value Sharing and Insist on the Development Strategy for A Beautiful HELI. President Zhang Dejin has a clear understanding of the existing development trend of HELI: currently, HELI ranks the 8th in industrial vehicle sales worldwide, but there is still a great gap with international giants in terms of added value of products and post-market services. As for the way to make up shortcomings, President Zhang Dejin noted that “HELI has taken a solid step in lean manufacturing, integration of information and industrialization, and intelligent manufacturing.” In addition, President Zhang Dejin shared the way HELI adopts to achieve value sharing with shareholders, employees, users and suppliers. Chen Qihua, President of Caterpillar China, delivers the keynote speech titled Intelligent Machine Era Leads the Future of Industry by Digital Technologies and Intelligent Services. 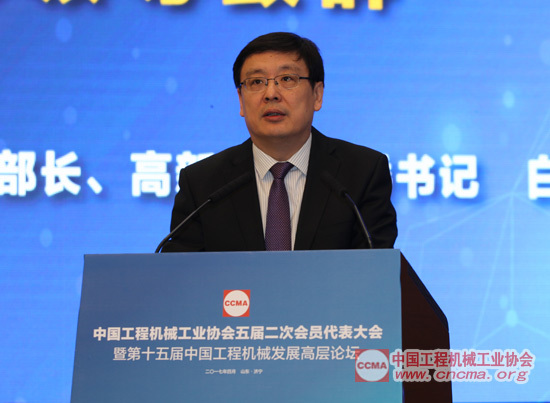 Chen Qihua, President of Caterpiller China, delivered a keynote speech titled Intelligent Machine Era Leads the Future of Industry by Digital Technologies and Intelligent Services. 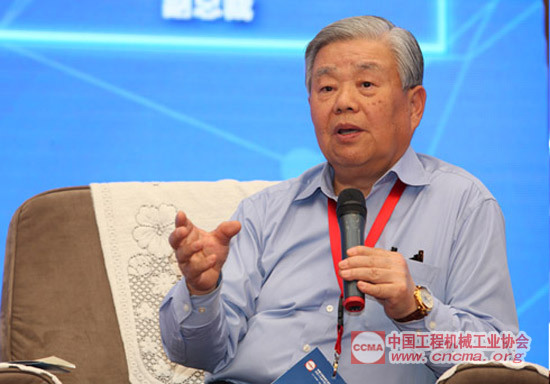 “The digital technology innovation in construction machinery industry has been launched from multiple dimensions, and Caterpillar has created more values for the customers through digital technologies and intelligent services”, said President Chen Qihua. Moreover, President Chen Qihua demonstrated through a video that the construction duration may be reduced by nearly 50% with the intelligent equipment of Caterpillar on the same path, significantly improving the construction efficiency and reducing the fuel consumption. 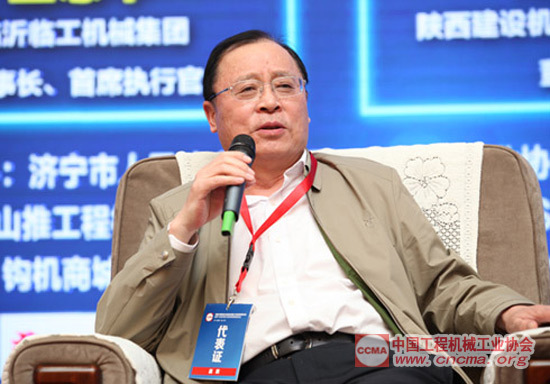 Then, President Chen Qihua shared the solutions for management of intelligent equipment and services, and noted that the intelligent machine and services will jointly improve the management efficiency and production efficiency of the customers’ assets, bring higher security guarantee and accelerate green development. Yin Zhengfu, Senior President of ZOOMLION, delivers the keynote speech titled Insist on Improving the Capacity and Building Healthier Industry Ecosystem. 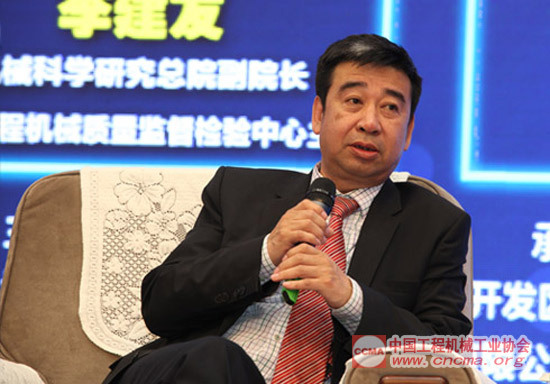 Yin Zhengfu, Senior President of ZOOMLION, delivered a keynote speech titled Insist on Improving the Capacity and Building Healthier Industry Ecosystem, and noted that: 1. enhance the internal strength, continuously improve the product innovation capacity and actively implement the Internet Plus; 2. intensify the external work, actively go abroad, and fully utilize the opportunity brought by the Belt and Road Initiative; 3. integrate the capital with industrial innovation, develop the enterprise stronger and bigger by setting foot in environment industry and agricultural machinery, and fully utilize the capital to accelerate the industrial transformation of ZOOMLION; 4. it is the mission of all enterprises to build and maintain the healthy ecology of the industry, and to promote the healthier and orderly development of the industry. Zhang Xiuwen, President of Shantui, delivers the keynote speech titled Stay True to the Mission and Jointly Create Values, and noted that Shantui always stays true to and earnestly practice its mission of breaking the monopoly of imported equipment in bulldozers with large horsepower. In the previous years, Shantui overcame all difficulties it suffered, but how can we grasp the opportunities with the recovery of construction machinery market? For Shantui, the demand of swamp bulldozers exceeds its supply this year, but the whole industry chain is rational without blind capacity expansion. As for the understanding of co-building of values, President Zhang Xiuwen noted that Shantui always adheres to the operation concept of focusing on values and wholeheartedly serving the users. In addition to value pursuing, Shantui also pursues the latest technologies and the most reliable quality. Thus, Shantui makes a bold trial to export the full hydraulic bulldozers to the Europe and America, which fully reflects Shantui’s confidence and determination. In terms of development of new products and technologies, Shantui has developed 200hp gas bulldozers that have been sold in Russia, as well as unmanned remote controlled bulldozers that are sold on the market. Wang Zhizhong, President of Shandong Lingong Construction Machinery Co., Ltd.
Yang Hongjun, President of Shaanxi Construction Machinery Co., Ltd.
Wang Ziguang, President of Komatsu (China) Ltd.
Cheng Yongliang, General Manager of China Railway Construction Heavy Industry Co., Ltd. Highlights of the 15th China Engineering Machinery Development Senior Forum: Luo Dong, CEO of WesTrac (Beijing) Machinery Equipment Ltd., presides over the Senior Dialogue; guests entered into dialogue and site communication on hot and focus issues of the industry centering on the theme of the Forum. Among them are Wang Zhizhong, President of Shandong Lingong Construction Machinery Co., Ltd., Wang Ziguang, President of Komatsu (China) Ltd., Li Jianyou, Director of China National Construction Machinery Quality Supervision Testing Center, Wang Weiyan, General Manager of SINOMACH, Xie Zhixia, Vice President of SANY, Yang Hongjun, President of Shaanxi Construction Machinery Co., Ltd., Cheng Yongliang, General Manager of China Railway Construction Heavy Industry Co., Ltd., etc. On April 14, 2017， the Forum organized a total of 6 communication meetings in two sub-forums themed by “Supply-side Structural Reform and Industrial Development”, “From Going Out to Going Inside” – the Vision of the Belt and Road and Building International Enterprise. A total of 37 representative enterprises and about 100 insiders attended the meetings and communicated with each other on the development of the industry. On the afternoon of April 14, 2017, participants visited Shantui and other enterprises in Hi-tech Industrial Development Zone of Jining for communication and learning. This Assembly is held after over 5 years of profound adjustment of the Construction Machinery Industry in China with stable recovery and restorative growth. Through this Assembly, the development vision of the construction machinery industry is clearly defined, and the confidence in development is built. In the future, we’ll continue to firm our confidence, tackle the difficulties, strictly perform transformation and upgrade, forge ahead, fully utilize the favorable opportunities, thoroughly implement the Made in China 2025 Strategy, further promote the structural supply-side reform of construction machinery industry, and consolidate the foundation for healthy, continuous and stable development of construction machinery industry.